I have a bit of cutting edge science for you today in the shape of a summary of a recently accepted paper of mine from the journal Water Resources Research. This paper covers a small side project from my PhD in which I used numbered metal tags and repeat surveys in order to track the movement of individual pieces of dead wood in a small river. The motivation for this research was to try and provide some guidance for river restoration and river management on the sizes of wood that should be used for logjam/deflector structures to maximise stability. Log #673. Logs were marked with non-toxic forestry paint to aid relocation. The main aim of this research was to try and establish a) how big a piece of wood needs to be before it doesn’t move and b) for pieces that are moving how far they go. I managed to answer both of these questions during the study and also came across some other interesting observations concerning logjams which I’ll go into in a future post. This work was carried out from Summer 2010 through to May 2013 and fortunately this meant we had two fairly dry winters followed by an extremely wet one. This allows us to look at the results in the context of flood magnitude on pieces of wood moving. This is typical of the sort of forest cover in the study river. 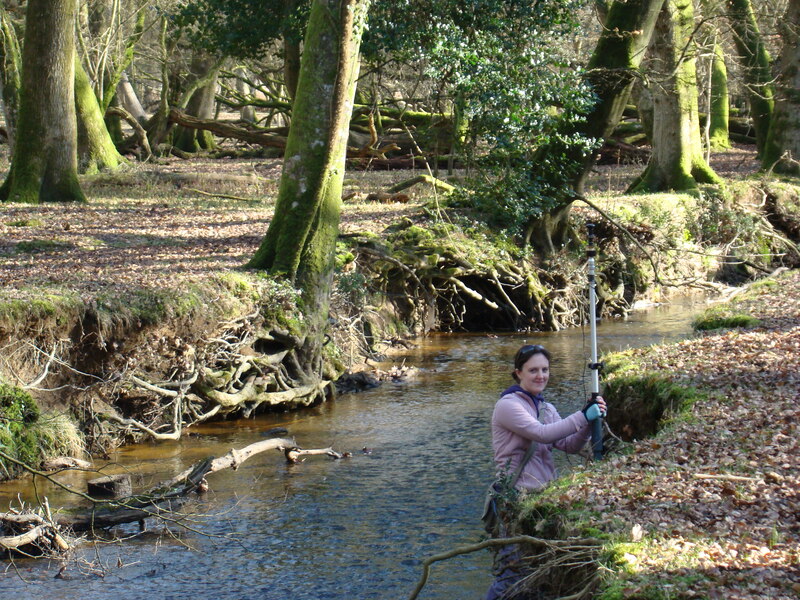 To give you some vital context the work was conducted in the New Forest National Park in the UK, the study river is fairly small, with an average width of just under 5m. The forests alongside the stream are mature, but not especially complex, there are between 4-8 trees on the immediate river bank every 100m and the mature tree density on the floodplain is 20-50 trees per hectare. Essentially the setting is a typical mature beech forest with fairly open, almost parkland like, woodland. I monitored wood in five sections of river that gave a good balance between meandering and channelized streams and open and denser woodland. In total I attached tags to 162 pieces of wood ranging from 1m to >15m in length. Of these only 39 (24%) remained in place for the whole 32 months of the survey. 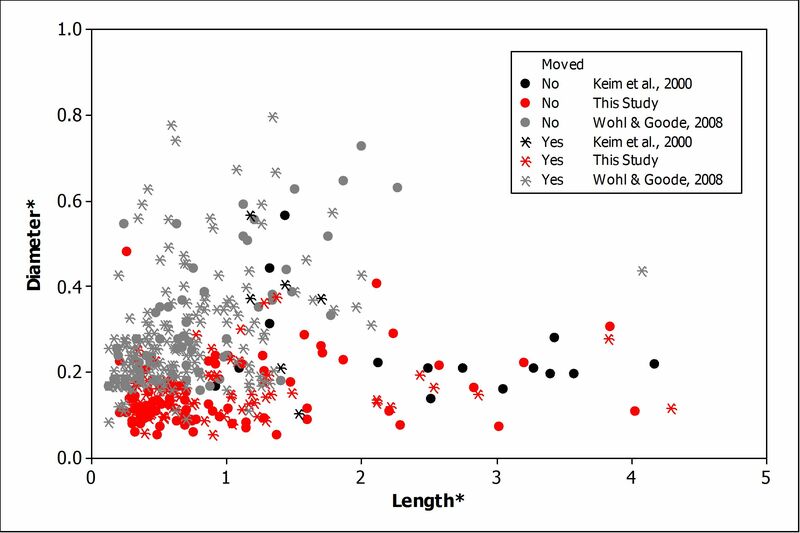 Using statistical modelling I was able to show that wood length, wood species class (e.g. “conifer”, “broadleaf”) and the complexity of branching explained 65-74% of the variability in movement. This means that these three factors control the majority of the variance, or likelihood of a given piece of wood moving. I was fortunate to get data from two other published studies allowing me to look across different rivers up to 8m wide, and this confirmed that the length of a piece of wood relative to the channel width is the key control on mobility. There are two reasons longer wood is less mobile; it has a greater weight so can better resist the forces acting to float and drag it, and it is more like to become caught or wedged at bends or against obstructions. Data from three studies showing a lower proportion of wood moves with increases length. Figure reproduced from Dixon & Sear (2014). I found that a piece of wood needs to 2.5 times the channel width in length in order to be considered functionally immobile, so for a small, 4m wide channel that’s a piece of wood 10m long. The results show that mobility begins to drop off at around 1-1.5 channel widths in length, but that is still 4-6m of wood in a 4m wide stream. These lengths are substantially longer than anything typically used in river restoration projects. The key implications here for river management is any wood shorter than 2.5 channel widths in length should be considered potentially mobile and anything less than the channel width should be considered potentially highly mobile. The data supports this for channels up to 8m in width (the largest we have data for), but given that covers pieces of wood up to 25-30m in length it is reasonable to assume it would apply to larger rivers (as trees/wood have a finite size in nature). Long suffering field assistant (on a day when she didn’t fall in the river). Of the logs that moved I was able to relocate 86 and thus by establishing the start and end points work out a transport distance for them. The range of movement was from 0.36m up to 5.6km, with 6 pieces moving further than 0.5km. This is substantially further than we were expecting. Perhaps unsurprisingly the data shows shorter pieces of wood move further; all the wood moving over 0.5km was less than 3m long. Crucially the results show wood transport is possible across logjams (there were multiple logjams between the start and end points of furthest moving wood) and over the top of the floodplain in big floods. We have synthesised all the results into a conceptual model, reproduced from the paper below, showing that the primary geomorphological controls on wood mobility are channel planform and density of forest cover. So what is the take home message from this research? 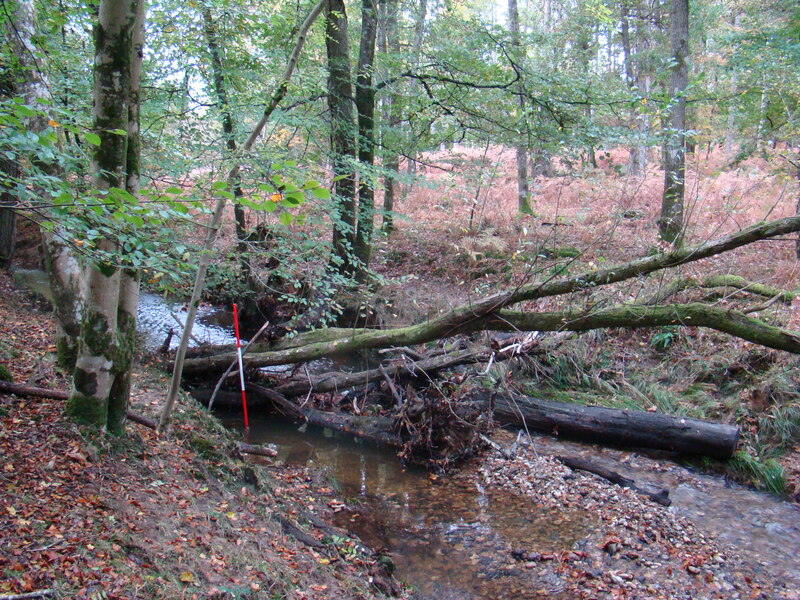 Wood is much more mobile in small forest streams than previously thought. 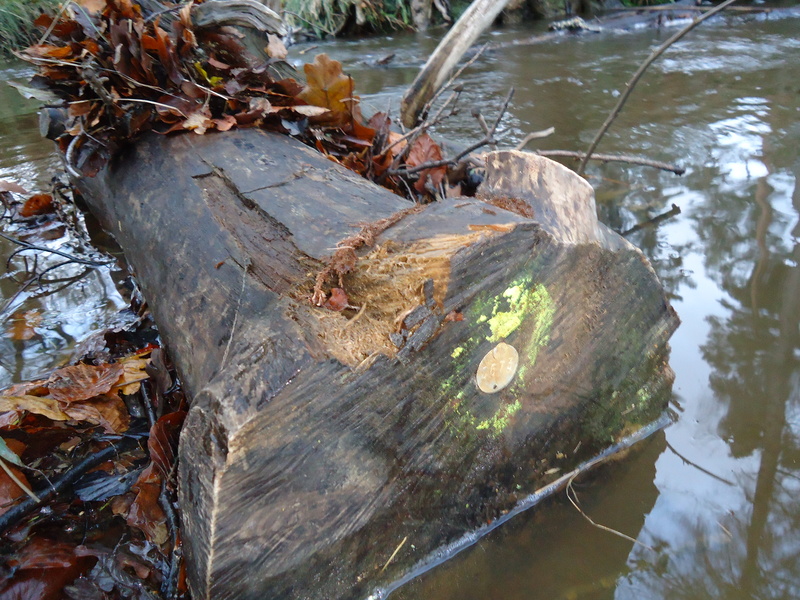 The implications for river management are that longer pieces of wood may need to be used if features such as deflectors and logjams need to be fixed without some form of anchoring. Potentially this could take the form of pieces of wood extended some distance onto the floodplain, particularly in the case of flow deflector structures. This could create issues with riverside footpaths, but the message is “go big, or go home”! Another implication is the storage/disposal of “waste” wood on the floodplain. I have seen many examples of wood removed from the channel being cut up into small pieces and placed on floodplains to provide terrestrial habitat, these results suggest such wood could not only be swept away but could move kilometres downstream in a flood. This need not be a problem, but managers need to be aware of the possibility and perhaps leave removed wood intact given greater size reduces likelihood of movement. The full paper can be assessed on the Wiley Blackwell website in review form (full typeset version will follow from the publishers) and I encourage people to read it if they want to find out more about the methods and the context (relative to other research). Please note it is NOT open access, however the AGU support the “green” open access route and thus I can put the paper on a website after a 6 month embargo. Thanks to the UK Environment Agency for funding the research. 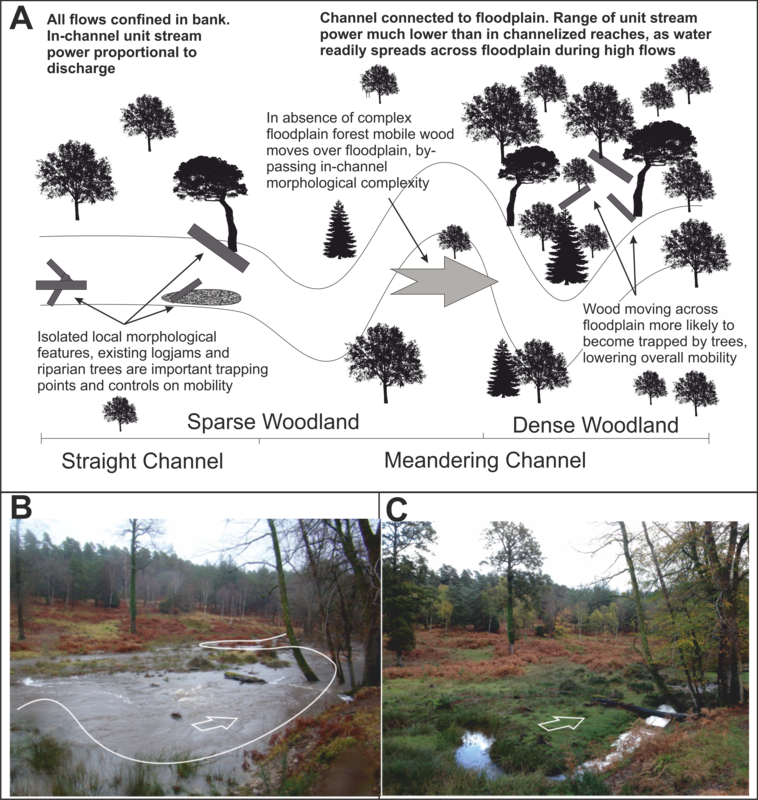 This entry was posted in Flooding, Geomorphology, paper review, River Management, River restoration and tagged ecology, ecosystem services, flood risk, flooding, large wood, research, restoration techniques. Bookmark the permalink. We had been working to 1.5 times the channel width, but have witnessed movement of much larger wood in similar channels, so it’s great to have something to flesh this out. I like the ‘go big, or go home’! Thanks! It’s important to say again that the channel width:length ratios are from measurements in fairly sparse woodland (relative to a pristine wilderness forest). The reviewers for the paper were keen that this was emphasised more in the paper, rather than these ratios being general guidelines for all rivers – the key being that bankside trees act to trap wood in the river and floodplain trees stop wood floating over the floodplain as easily. However if you look at the photos above (or look at the location on GoogleEarth) I think the forests are about as good as it gets in many parts of UK, and in fact in most places the forest density will be lower. So I don’t think its a big stretch to use these ratios as cautious estimates of what size wood could be mobile in most UK rivers. Really interesting research that Simon and definitely needed if ‘natural’ flood management is ever to get off the ground with the more risk-averse agencies. I’m guessing from the summary that you were principally monitoring individual wood pieces (albeit some of them pretty large)? Is there any intention to look further at the mobility of logjams or more complex ‘clumps’ of woody vegetation themselves? I would imagine that the failure or movement of such a feature might represent an even greater risk of blockage than with an individual piece? Yes, the wood monitored was individual pieces, BUT these were all the naturally occurring pieces in the five study reaches, so in many cases they were the component parts of logjams, not just isolated pieces. I didn’t find a very strong (statistical) relationship between movement and presence in a logjam, i.e. statistically, logjam pieces were no more or less likely to move than isolated ones. However an important caveat is the number of logs studied may have been insufficient to pick out a relationship if one existed. The behaviour of wood in logjams and logjams themselves is another key part of the study and I’ll write a separate blog about this at a later date. It would be great to study the failure of logjams, however it could be a potentially tricky experiment. The big problem is I’ve inferred what happens based on before and after snapshots, which although fine here, wouldn’t really be so good for studying structural failure. For that we’d probably need something like timelapse cameras to monitor during an event. A method they have used at University of Southampton recently to study logjams. But even then you can only see above the water surface (from a limited range of angles based on number of cameras), so are *still* not getting the full picture. There is some evidence from scaled down flume studies that when a group of logs “fails” they then move down the river as a “clump”, what was called “congested transport”, meaning it is more likely the mass with fetch up somewhere else and get jammed. With implications for blocking bridges etc. BUT the key thing is the width:length ratios in these flumes represent scaled down larger rivers, probably something in the order >20-30m wide in reality.